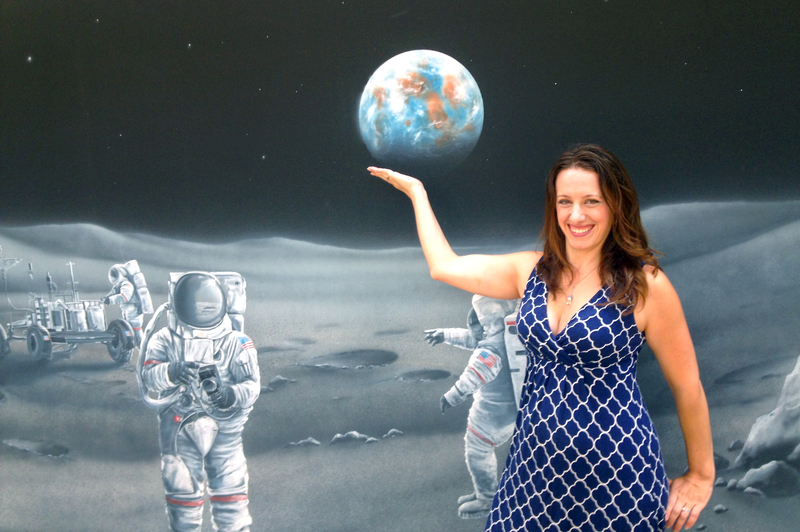 Florida Tech astrophysics alumna Laura Forczyk uses her company, Astralytical, to help build the space industry in Georgia. You can take the girl out of the Space Coast, but you can’t take the Space Coast out of the girl. When Florida Tech astrophysics alumna Laura Forczyk moved to Georgia in 2016, she wasn’t quite sure what her future would really hold. Her previous employer closed its doors at Kennedy Space Center, and she was in the third trimester of her pregnancy. She knew she didn’t want to start a brand-new job with a brand-new baby, so the only logical step was to start her own business. Thus, Astralytical was born in January 2016 – a few months after her child. Astralytical is a consulting company for the space industry and professionals. From helping individual clients, to companies and local and federal government, Forczyk has positioned herself as an authority on the industry and has a direct hand in shaping its future. Florida Tech astrophysics alumna Laura Forczyk started her own company, Astralytical, in 2016, and is shaping the space industry in Georgia. Forczyk analyzes the industry and space tourism, looks for the opportunities that exist and studies the details that are often overlooked. All the while, she continues to consult with individual clients who need advice on advancing their careers or just getting started in the industry, whether they are students or changing careers later in life. All of this ultimately translates to taking an active role in policy-making, both on a local and national level. As it turns out, Georgia is a fertile state for space policy. In addition to a few space companies based out of Atlanta, Georgia wants to have more of a place in the industry. Whereas Florida has been established for quite some time and has policies in place for space exploration, Georgia doesn’t. That’s the opportunity Forczyk is most excited about. With a potential spaceport planned in Southern Georgia, the state wants to attract high-tech companies and ventures. Forczyk had a part in making that happen by providing the state legislature with information and speaking on behalf of the space community to help pass the Georgia Space Flight Act. This would define the parameters for space flight activity in the state. As Forczyk continues to look forward and predict the future of space travel and exploration, her focus is now on the millennials who are working in or are students hoping to work in the industry. She interviewed 100 participants and will be publishing a book this year under the Astralytical brand. In it, she will answer questions about stereotypes and also explore where they think the industry should go and their feelings about where it is currently. As a young woman in science, Forczyk knows better than most that the future of space lies in the promise, skill and ambition of the next generation. She will continue to use her experience to push boundaries both here and in space.